Another wet winterval of woe in the UK. From Ballater to Blackburn countless homes have been rendered uninhabitable, small and larger businesses disrupted, and major and minor elements of infrastructure destroyed or severely damaged. In December 80,000 people were without power and some were still without it into the New Year whilst others lost phones and internet connections. And it is a lie that these storms were “unpredictable” and that no-one realised that more needed to be done. Somerset Levels floods of winter 2013-14, total funding for flood protection had declined by 10% in real terms since 2010-11, and “sustaining the current standard of flood protection is challenging in this context, especially as climate change increases the load on flood defences”. As did others. 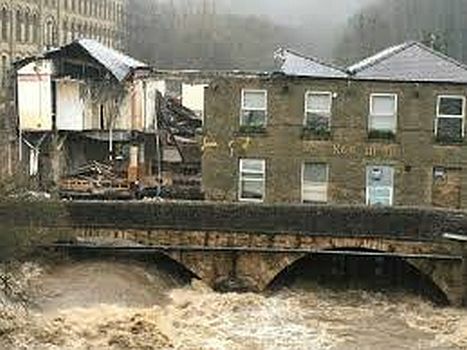 … Yorkshire’s regional flood and coastal committee (RFCC) warned about the potential impact of the region’s revenue funding gap just weeks before floods overran towns and cities in the region. Minutes of the committee’s October meeting, which would have been distributed to senior civil servants and ministers, show Professor Colin Mellors’ warnings against central government cuts. One of the places mentioned was Leeds. Nowhere has the flooding been more surprising than Leeds where historically little flooding has occurred. Leeds Council had apparently offered in 2011 to put £10 millions of council money into flood defences if the Government would match it but the latter reneged and, in fact, even cut other proposed plans for defences along the River Aire. The Labour council needed those schemes. No council has built more houses on flood plains than Leeds (in fact at twice the rate of any other council in England and Wales and tent times more than most). Cash-strapped councils in an age of austerity will do unwise things but Leeds still plans to build another 1000 houses alongside the River Aire at Kirkstall. Worthy stuff but does not identify or clarify anything like all the issues. Some of these are avoided for good reason. Under the present profits-based system they would stamp on vital interests. Take for example the idea of land management. Anyone watching the heather burning on our moorland will know that this removes much of the vegetation needed to retain heavy rainfall. But grouse shooting and their hypocritical claims to land management is a multi-million pound industry which brings in revenue for landowners. And there are other factors. Leeds is not the only place where there is excessive building on flood plains. The UK builds 10,000 houses a year on flood plains or 1 in 14 houses built in the UK is in danger of flooding. In a housing shortage many people don’t have much choice but to move into these houses. The builders don’t want to eat into their profits by providing defences (and are not obliged to by law) and so the state effectively subsidises them by taking on responsibility for flood defences and the clean up afterwards. At the same time it is reckoned that the building companies are sitting on land for speculative purposes which could provide 600,000 homes but they don’t want to build as rising house prices make their revenue flows greater. The hoarding is both a reflection of the lack of profitable investment opportunities generally, a 'safe' haven for liquidity, and a reflection of the fact that profit trumps peoples' housing needs every time. For their part successive governments have recently spent a fortune supporting banks but sadly not much on the kind that hold back flood water. Typically for them it’s all about finance. Whilst the rich like the Aga Khan can build a foolproof mansion alongside the River Ouse in York, the rest of us have to make do with promises. The Cameron solution is to suggest a re-insurance fund to bail out the insurers who will lose money over the claims. These are the same insurers who inform us that this year’s floods will cost the victims £5 billion but 20% of that will not be covered by their policies. See the forthcoming Revolutionary Perspectives 07 for an expansion on this theme and on the miserable results of the COP21 conference in December 2015. I was struck by this. "...a society which leaves everything to state agencies also loses its capacity to act independently..." And having also been struck yesterday by D. Cameron's listing of and emphasis on the amount of money being spent on floods, in PM's Questions, I came up with the answer that MONEY ISNT EVERYTHING. (What originality; what insight; what wisdom!) Now I have to try and explain what I mean. Can I do it? Its something like this. Capitalist society has reached a dead end, not just because of the falling rate of profit and the saturation of the markets, and not just because, as bourgeois politicians forever point out "there isn't enough money available at the moment - it'll be better the year after next" etc., but because in addition to what might simply be called "financial restraints" the overwhelming suffocating deadness that emanates from capitalist decadence and the stench of the decaying world economic and social order, really is "a suffocating deadness" and a massive stupor-inducing blockage and mental restraint. And this awful deadness represses many of our natural human responses to life, including our feelings of solidarity, our instincts to help each other out, our feelings of heart-warming sympathy for each other and finally our very ability to take responsibility for ourselves, and for our class, and "start to take matters into our own hands..." as Clastre/AD express it so well in the quote above. The Muslim and Syrian refugees took matters into their own hands by packing up and marching north. It'll do them little good however. They may have crawled out of the mid-eastern fire only to find themselves in capitalism's frying pan of austerity, unemployment, broken health services and social support systems, and all the other horrors of a quaint outdated economic and political system that passed its sell-by date a century ago. What taking matters into our own hands really means is much simpler than setting out on a long march. It means seeing reality for what it is; identifying capitalism as the mechanical life crushing system that it is; recognising the endless grind of work and barter, the getting and spending through which we lay waste our lives (as Wordsworth put it long ago); realising that our innate sense that the current capitalist way of existence is robbing us of our very humanity and even the joy of being alive, isn't a bad dream not to be mentioned or talked about, but is a fact and is an intuition shared by many, and is a matter we can do something about if and when, as workers, we begin to take matters into our own hands. The capitalist class are taking us down the winding road to ruin. We have to respond.